‹ Hiatus? They love us! Get it? It’s a thermodynamics pun! How many brewing blogs give you wordplay like that? None of the reputable ones, that’s for sure. Anyway… Last year I started experimenting with partial boils, due to not being able to use a garden hose in the winter. And that technique has been working well for me, though it has some limitations. It would result in an unworkably thick mash when brewing a big beer, for example. More importantly, I anticipate brewing a lot of test batches for Two Mile in the near future, and there’s always the possibility that some unforeseen flavor impact could rear its ugly head. But even during one of the driest winters on record, the one thing Silverton has in abundance is snow. Sticking the kettle into a snow bank isn’t going to do much (snow being one of nature’s great insulators), but melting some of that snow is going to make a hell of a heat sink. So I have a new toy, a Little Giant water pump. It’s rated 63 gallons per hour at one foot of lift, which turns out to be a little less than I’d like for a five-gallon batch – it took 60 minutes to chill 5.75 gal of wort from 92°C to 11°C. The majority of the chilling was done in the first 20 minutes, though, so I consider that acceptable. 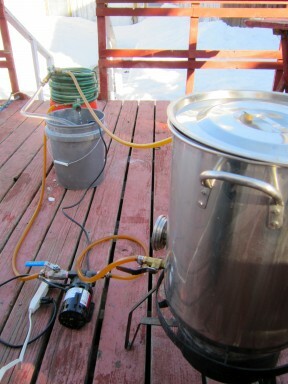 Next time around I’ll try to position the heat exchanger so that the pump is fighting a little less static head. If I can get the kinks worked out this may become my standard wort chilling technique, at least during the nine months of the year there’s snow on the ground.